I had to write the departmental narrative for my church’s 2014 annual report this week. When you work with numbers all day and try to make sure they are accurate, exercising my fingers on the keyboard in a word narrative always feels great! Writing this blog over the past six months has also felt great, and I am grateful that people are actually reading it, even if they are just my supportive family. Thank you Aunt Carolyn, Sally, Susan, Alex and the rest! In looking back at 2014 from my perspective as a church member and as a member of the church staff, one thought kept running through my head and it was a song. Any other time when a song gets stuck in my head I call it an earworm. It usually happens at night and keeps me up as it endlessly replays, like when the needle used to get stuck on an old 33 or 45 rpm record. This one wasn’t like that. It was a prayer in thanksgiving to a God who has shown up over and over again in my life, whether lived in the day-to-day in Omaha, or on my travels to Lebanon, Syria and Iraq. Great is thy faithfulness! Great is thy faithfulness! Morning by morning new mercies I see. Thou changest not, thy compassions they fail not. As thou hast been, thou forever wilt be. Gosh, that’s a great hymn! I even used it once in a devotional in Basrah, Iraq. The hymn was written by Thomas Obediah Chisholm in 1923 and the music was composed by his friend William Marion Runyon. And like many hymns, this one was inspired in the life of this dear brother in Christ by words from scripture. This short book of scripture, only five chapters long, is attributed to the prophet Jeremiah, who proclaimed the word of the Lord to the people of Judah. There was certainly a lot to lament if you read through the entire fifty-two chapters of the book of Jeremiah! God’s people suffering due to their own lack of faithfulness to the one who brought them out of captivity. We did that book once in staff Bible study and it was one of the most depressing seasons we have ever experienced in studying the word. There was great joy when it ended! And that is why these two little verses in a five-chapter book stand out to me. In a book called Lamentations, where the writer is grieving over such loss, he stills calls out to God with a word of acknowledgement that he has been faithful, he is faithful, and in fact, his faithfulness will be seen in the mercies of each new morning. And that is the cry of my heart in this new year, a year of 365 new mornings, each filled with the mercies of a God who loves me. My family is still grieving over the violent loss of our dear baby sister Cathy and seeking justice for her, and we walk those days together. My family of faith in Syria and Iraq are experiencing the darkness of night of ongoing wars, yet still shining the light of God as they serve those in need. Transitions in staff at church are hard, long-time friends I have served with and are now gone. The loss of George in 2012. Saying good-bye to Terri and Andy and Allison just this past year. Wondering who is to come and serve alongside me in ministry at West Hills Church. Watching Jana’s slow decline but seeing her get out of bed every morning and step into each new day. I say to myself: Julie you believe. Keep believing this Lord who walks with you. Wait for him, as he waits with you. 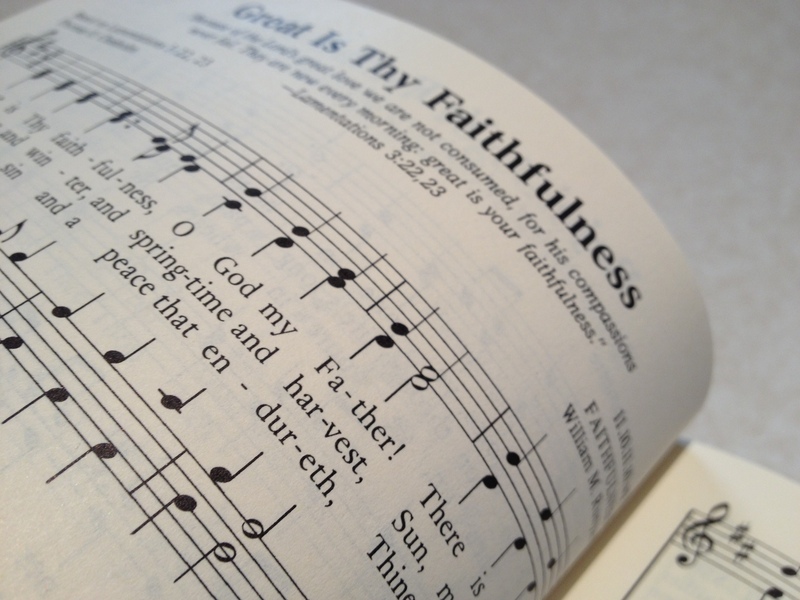 Great is thy faithfulness, Lord unto me. Great indeed is our God! I had no idea that hymn was so new. Thank you for these words that encourage me too, through my own merciful mornings.